A home cinema is a must-have in any contemporary home with the space to spare. With wide screen TVs and projectors more affordable, and a variety of providers streaming the latest box sets, a home cinema is the perfect place for the whole family to unwind. 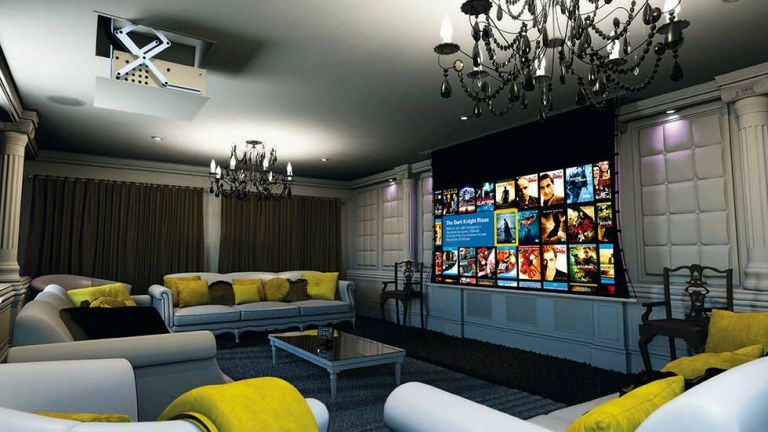 Creating a home cinema isn't has complicated, high tech or expensive as it sounds – although you can spend thousands. However, you do need to get it right to get the most from the room itself, and to ensure that the surround sound noise emitted from it doesn't disturb the rest of the household. Read our guide to create your own home cinema – the perfect project for anyone renovating a home, extending or converting a garage. Dedicated home cinema room or multi-purpose space? When planning a cinema room, first consider how many people will use the space at a time – will it just be your family, or will you be inviting guests to enjoy the latest blockbusters with you? The answer to this question will determine the amount of seating, and therefore, the space, you need. At the same time, you need to consider the cinema room's layout, taking into account factors such as screen size, viewing angles, the projection method, seat comfort, speaker placement, equipment storage and acoustics. ‘At the very minimum you’ll want to include a high-quality screen, speakers, an AV receiver, mood lighting, a dedicated control system, and comfortable seating,’ says Robin Bailey, from GadgetMyPad. All this will, of course, be more difficult to get right in a multi-purpose room. Left For pure indulgence, combine a home cinema with a games room. The room's size and shape will make a real difference to its success. Rectangular rooms make better cinema rooms than square rooms because they allow you more flexibility with seating positions. Working out home cinema seating positions can be easily achieved with a simple equation (or geometry). Start by drawing two lines from the estimated seated position to the edges of the estimated screen size; this is your viewing angle, which should ideally be no smaller than 33-35° to 40° maximum (any larger and you will feel uncomfortably close to the screen; any smaller and it will feel more like a TV-watching experience than a home cinema treat). TV screen or projector? And how large? OLED TVs, 4K TVs, smart TVs? Which to choose? Find out everything you need to know about buying the latest TV technology in our buyer's guide. Slimline TVs are easy to mount on walls. Don't be an early adopter: the newest models quickly reduce in price over the course of a year, so paying for the very latest design is unnecessarily expensive. Picking a TV that's been around for a year or so will allow you to read all the TV buying guides and reviews so that you can make an informed decision. Can be watched comfortably in a light-filled room, so a good choice for multi-purpose spaces where the super-sized TV is also the family TV. Looking for a screen larger than 100 inches? The only way to go is with a projector. For best audio results, it's worth considering placing speakers behind the screen; this will require an acoustically transparent screen, which will be more expensive than a drop-down screen. A drop-down screen can be convenient in a room that's used for other activities; that way, the home cinema needn't dominate the space when not in use. It is more important to get the light levels right in a room with a projector, so ensure window dressings block light effectively. Entry to mid-range projectors are fairly quiet, but some of the larger, high-end projectors are noisy and produce heat. If you choose one of these you might like to consider mounting yours in the ceiling and venting the heat outside. ‘Think about where the cinema room will be located in relation to other rooms in the house, as soundproofing will be required if there’s a chance of noise disturbing other spaces in the home,’ continues Robin Bailey. You can, of course, create an inner wall of studwork, providing space to conceal speakers and to create sound-proofing – but this won't be practical if you'll be converting an already small room, perhaps a single garage, into a cinema room. If the cinema room has windows, automated blinds will reduce glare when you’re watching films, and will help with acoustics too, especially if matched with thick, lined curtains. Seats will, undoubtedly, be comfortably upholstered, too – another good way to help with acoustics. Want a prettier look than carpet tiles on the wall? Upholstered walls do a good job of absorbing sound. Any home cinema room worth its salt has to have surround sound, which means speakers positioned to distribute different layers of sound. Most cinema rooms use 5.1 surround sound: the 'five' represents the five satellite speakers (three around or behind the screen (left, right and centre), and two at the rear of the room); the ‘one’ is the subwoofer, which provides the low-pitched frequencies or bass. You can also opt for 6.1, 7.1, 7.2... surround sound systems, but this doesn't guarantee better sound. If you're creating your cinema room on a tight budget, go for a good quality 5.1 system, than a basic quality 7.1 arrangement. Don't miss our guide to the best home theatre speakers and to the best surround sound speakers. What you do here will be largely down to your budget, whether you're renovating an entire house and starting from scratch, or adding your home cinema room to an existing system. However, there are some minimum requirements. For example, streaming films or programmes requires a stable bandwidth provided by a wired connection to the internet. Ethernet cabling should be solid copper – minimum Cat5e. Cat5 CCA is much cheaper, but is actually copper-clad aluminium and won't work well. Cat6 is more expensive as it offers a larger bandwidth, but will be your best choice, particularly if you have a 4K TV. Whichever you choose, it's more than worthwhile consulting a specialist installer (ideally one approved by the industry body CEDIA) at an early stage. They will take into account not just your needs, but the room's potential future use, will make sure you have ample coaxial and internet points and power points, and their drawings can be used by your electrician for future installations. Planning the room early and in minute detail will allow you to take steps to conceal the projector or speakers, as well as the cabling. Bear in mind that speakers don't have to be behind a skim coat of plaster; if you're retro fitting your cinema room on a budget, they can be colour-matched to walls (or walls colour-matched to speakers...) or covered by artwork (try Artcoustic). You can keep costs down by choosing wireless speakers over wired ones, or by picking out a good quality soundbar, which can sit neatly below your TV on a cabinet. How much will a home cinema room cost? The cost of a home cinema room really depends on quite how far you want to go. If you've only got £2,000 to £3,000 to spend, you can create a basic room with a good TV, A/V receiver, speakers and control. A multi-purpose cinema room with sofa seating, dimmable lights, projector, screen and surround sound will start at around £10,000. With £15,000 to £40,000, you can create a two-seat luxury cinema in a garage-size room. Going budget crazy? ‘There’s almost no limit on how much you can spend – a top-end projector alone will cost from £100,000, so a high-end home cinema can easily cost from hundreds of thousands,’ says Michael Holmes.